As a woman in the working world, finding tall women's suits and other businesswear can often be a challenge. While buying a two-piece suit that comes together as a set can be a great thing, it's not always super easy to find. A few tall stores do offer sets, but most sell their businesswear as separates. Even as separates, though, you will still be able to finding matching blazers and dress pants that can be paired together as a suit. Or, mix it all up and wear a business jacket with pants of a different color. It's okay to bend the style rules at work! Add in a fabulous dress shirt and you've got all you need to look your professional best. 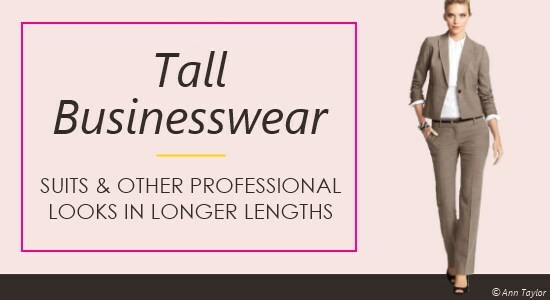 TALL TIP: Long Tall Sally offers a wide variety of women's businesswear. Right now, get free shipping on a $30 order ! Long Tall Sally ($$) Tall businesswear section includes women's suits, dress pants, blazers, dresses, skirts, dress shirts, and blouses. Also offers tops, sweaters, coats, activewear, sleepwear, swimwear, and maternity. Shop online or at retail locations. Based in the U.K. Also in the U.S. and Canada. Eddie Bauer ($$) Offers casual and outdoor styles as well as professional businesswear and suits for tall women. Most of the entire women's collection including jeans, pants, tops, dress shirts, sweaters, dresses, skirts, suits, outerwear, sleepwear, and swimwear are available in tall. Ladies pants and denim have a 36" inseam. Plus sizes available. Ann Taylor ($$) Sophisticated, classic style including a variety of professional and businesswear fashions such as tall women's suits, dress pants, and blazers. Long ladies jeans and pants come in 35" inseams. Also has tops, dresses, skirts, and jackets in longer proportions. Select Tall in the main menu for all tall clothing. Shop online or at retail locations. Banana Republic ($$) Fashionable, contemporary businesswear and apparel. Wide variety of long size jeans and pants in 36" inseams. Also offers tall women's suits, professional jackets, dress shirts, tops, sweaters, dresses, and skirts in tall ladies sizes. Select the Women's Tall category to view all tall clothing. Get free shipping on any order over $50! J.Crew ($$) Fashionable, contemporary apparel. Long length jeans and pants in 36" inseams with a select few in 35" inseams. Also offers tall women's suits, tops, jackets, sleepwear, and swimwear. Select the Tall option under Special Sizes in Women's apparel. EXPRESS ($$) Long denim and business pants with inseams of 35". In the Jeans and Pants categories, select your size from the drop-down menu. New York & Company ($$) Fashionable, contemporary apparel. Long length ladies jeans, dress pants, and suit pants in up to 35.5" inseams. Also offers jackets, businesswear, and activewear in longer proportions. See the Tall category for the entire collection. Shop online or at retail locations. Gap ($$) Fashionable, trendy apparel. Variety of long size jeans and pants in up to 37" inseams with select styles in 38" inseams. Tall businesswear styles include dress pants, dress shirts, blouses, and blazers. Also offers tops, sweaters, dresses, skirts, coats, and maternity in tall sizes. Get free shipping on a $50 order! Alloy Apparel ($) Tall jeans and pants (some businesswear styles) in 35" and 37" inseams. Also offers ladies tall dresses and skirts in extended lengths. Select the Tall Shop to view all tall clothes. Plus sizes available. JCPenney ($) Tall and ultra-tall size jeans and pants in up to 37.5" inseams. Businesswear section includes tall women's suits, blazers, career skirts, and dress shirts. Also offers tops, sweaters, jackets, activewear, sleepwear, swimwear, and maternity in long proportions. Select the Talls option under Women's apparel to view collection. Extended sizes available. Simply Tall ($$) Specializes in clothes for tall women. Sophisticated, classic style. Long ladies jeans and pants (dressy and casual) in 36" to 39" inseams. Also offers tall women's suits, jackets, tops, activewear, and sleepwear in long proportions. Plus sizes available. Jessica London ($$) Tall plus size clothing to size 28. Find plus size tall jeans and pants in up to 35" inseams. Also sells a selection of tall pantsuits and skirt suits as well as tops, dresses, skirts, and jackets. Select the Talls category in the Clothing section. Metrostyle ($) Fashionable, trendy apparel. Tall jeans and pants in up to 35" inseams. Also offers tall women's suits, skirtsuits, blazers, tops, dresses, jackets, and activewear. Select the Tall option under the Petite & Tall section. Extended sizes available. Next ($) Tall size jeans, pants, and trousers in 35" inseams. Ladies tall businesswear includes dress pants, blazers, career dresses, work skirts, and dress tops. Also carries tall shirts, sweaters, jackets, activewear, and sleepwear. Select Tall under the Women's section. Based in the U.K.